“Men of Worth is such a worthwhile project, offering people an insight into their ancestors as well as providing closure for those who do not know what became of their lost relatives. Personally, witnessing the hard work that Andy and Ian put into making sure that my Great Great Grandfather, Herbert Moore, received the military honours and war grave he deserved was not only touching but extremely emotional. Herbert’s story has stuck with, not just me, but my whole family and it is thanks to Andy and Ian that he will remain with us for generations to come. It is important for us to remember these men, women and children, and it is projects like the Men of Worth that do this work - on behalf of a nation obsessed with assuring that the stories and personal histories from our past, quite rightly, never get lost. It was with great pride that I read your feature on the Bell brothers of Haworth – Saving Private Ryan plot was real life for Keighley men (Keighley News, March 27). Why? Because they were related to me. My dad, Bob Pickard (named Joseph Robert after his grandad), researched the story of his grandad Joseph Bell and his brothers, James, John, Herbert and Lawrence (Laurie) beginning in 1989 when he was made redundant from his job as a printer. During the following seven years he worked hard on their stories, writing to regiments, the War Office etc, bringing together a folder filled with every bit of information we could need in the future. He also visited every grave except Herbert’s, because that is in a war zone. Thank you for featuring them and bringing their story to the attention of the national media. I am extremely proud of my ancestors. ON SUNDAY I was honoured to attend the very moving unveiling ceremony of Private Herbert Moore's headstone at Oakworth Cemetery. This was an official First World War headstone that is to recognise the sacrifice Pte Moore made. It is thanks to the Men of Worth Project and the research it has carried out that Pte Moore is now recognised by the Commonwealth War Graves Commission as a casualty of war. The work of the Men of Worth Project is led by Andy and Helen Wade and Ian Walkden, and I wish to thank them for all the work they do to recognise the sacrifice that was made by so many local men. The dedication on Sunday was attended by members of Pte Moore's family, civic leaders and many local people, and was supported by Oakworth Village Society. 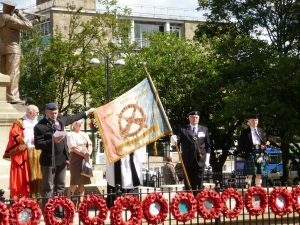 COULD you please thank the Men of Worth Project's Andy Wade and Ian Walkden for organising the '100 years since the outbreak of war in 1914' event at the Town Hall Square in Keighley. Keighley Mayor, Councillor Graham Mitchell, supported the organisers of the event, which was really informative and well-received by the spectators. The list of those who failed to come home, and the history and make-up of the Old Contemptibles standard (Keighley Branch), was excellent.